Women on the first floor of the mental health hospital are eager for the reconstruction to reach their rooms. Shabby dressed patients are disorderly walking from side to side. Sometimes they come up to the windows and look down through the cells to take part in the yard liveliness. Some faces inside the building frown, some smile. Discussions begin. Construction materials are all over the yard. Work is in full swing. After decades of miserable conditions the Syunik Mental Hospital in Kapan is finally being reconstructed. "We are saved. We have finally succeeded in convincing everybody that the psychiatric hospital is not a lunatic asylum, and the number of people giving a helping hand should increase," says Ararat Vardanyan, director of the neuro-psychiatric dispensary. According to the director, one of the main disturbing problems of the hospital has been the condition of the building. Outside the interest of mainstream healthcare, the hospital - built in the 1960s - has been leading a vagrant life. "Since the foundation day the hospital has been moved from one building to another for 12 times. As a consequence both the patients and the staff suffered, and the whole property of the hospital became almost worthless," says the director. 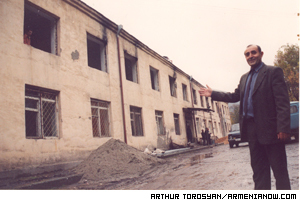 In 1993, when the Armenian Army wanted to use the psych hospital for a barracks, psychiatric patients were moved to the tuberculosis sanatorium. As a result, eight mentally ill patients contracted TB and died. Only after years of struggle and seeking help, it became possible to separate the hospitals, moving the tuberculosis patients to another building. The building, worn out physically and morally, was left inside the care of the psychiatric hospital. But about a month ago, reconstruction work began, with financing from Save the Children and from the United States Agency for International Development. According to Vardanyan, reconstruction will cost $101,500. About $8,000 of the cost is being paid by Kapan city government. "Due to the war, social-economic crisis, and critical conditions of life, the number of people with mental problems has increased during the last years," says Ruben Sargsyan, the vice-governor of the Syunik region. "So, if for some reason the hospital was out of attention in the past, today this project is considered very important, and the community has also made its investment in it." After years of appeals, director Ararat Vardanyan is glad to see his hospital get much needed attention. Sargsyan says that by spring the psychiatric hospital, having overcome so many difficulties, will be the most modern in the republic. According to construction workers, in case of favorable weather, the new hospital will be ready in January of 2004. Two floors of the hospital will be completely repaired, and patients will be treated more effectively in new and bright hospital rooms. "There were some cases when the patient, seeing the terrible conditions of the hospital, refused being treated here, saying that he can't be cured in such conditions," Vardanyan says. "The walls were crushed, the doors were broken, and the condition of the wood floor was beyond imagination. Very often the patients had to walk on the concrete." According to the chief doctor, there were also cases when relatives refused to leave the sick patient in such conditions. "It was extremely difficult for us to work in those terrible conditions as they can delay the patient's cure, creating numerous difficulties for doctors," Vardanyan says. According to Vardanyan, provisions have been made for a music room, where patients can express themselves through music. The yard will include a pavilion for rest and there will be a small workshop of wood and metal working as well as a place for sewing. 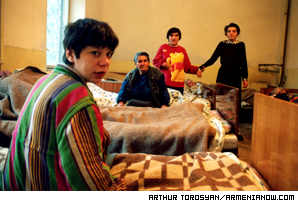 According to statistics, more than 2,100 mentally ill are registered in the Syunik province. However, according to specialists, the true number is much higher. Editor's Note: Over the past six years, reporter Grigoryan has written stories pointing out the inadequate conditions of the Kapan hospital. Doctors at the hospital say her stories helped bring attention to their needs and were a catalyst for getting help.